TORONTO, ON--(Marketwired - February 08, 2017) - Wesdome Gold Mines Ltd. ("Wesdome" or the "Company") (TSX: WDO) is pleased to provide an update of underground drilling progress at its 100% owned Kiena Mine Complex, in Val d'Or, Quebec. Since the last update on November 15, 2016, a fourth drill has been added on the 960 metre level (Figure 1), 29 drill holes have been completed and assay results have been received for 21 drill holes (Table 1). The new drilling continues to trace the Kiena Deep mineralized system along an altered and deformed north north west trending ("NNW") basalt-komatiite contact zone. To date, it has been traced 550 metres NNW along strike and over a depth range of 400 metres. It remains open at depth and along trend. Wesdome continues its accelerated drilling program with the goal of determining the extent, continuity and geometry of the Kiena Deep gold system. Mr. Duncan Middlemiss, President and CEO, commented "Drilling results have been accelerated with the goal of delineating and defining this significant new find as quickly and efficiently as possible. This set of Kiena Deep drill results continues to deliver grades substantially higher than the historic production grade profile at Kiena of 4.5 g/t. We are also very encouraged by step out holes confirming mineralization now tested along 550 metres of strike length, indicating a potential large new gold system. Furthermore, in the Company's efforts to accelerate our advanced exploration at Kiena, we are pleased to announce the appointment of Marc-André Pelletier as Vice President of Quebec Operations, who will be based full time at the Kiena Complex. Marc-André has over 20 years' experience in underground gold mining in Canada, and will be working closely with our geologic team to evaluate ramp development. On behalf of management and the board, I would like to welcome him to the Wesdome team." Drilling continues to identify two styles of mineralization spatially related to a basalt-komatiite (ultramafic) contact zone that trends NNW. Albitized stockwork and vein breccia systems in sheared and altered zones (Lower Stockwork Zone). There are likely multiple zones which remain only partially defined and are open. The full extent of the mineralized system has not been delineated. It has been traced 550 m along the contact area trend between depths 1,000 and 1,400 m and remains open. Step out holes 6146 and 6147 are of significant interest as these holes have intersected quality grade over wide widths some 150 metres north, and 250 metres south along trend of the known mineralized system, which remains open (Figure 1). Four drills are operating on levels 670m, 770m, 910m and 960m. Challenging drilling conditions in the deformed and altered contact area have been addressed with a combination of bits, drill assemblies and specialized drilling reagents. The experience obtained in these conditions and the additional drill added to the 960m level has resulted in improved success in attaining the desired targets. Shorter holes with better attack angles will continue to accelerate results. 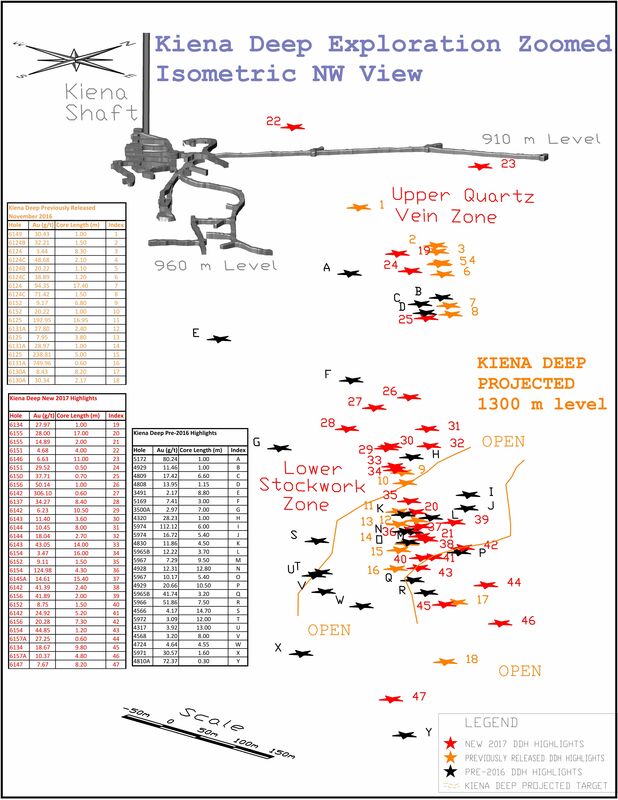 The accelerated drilling is designed to delineate the potential size of the Kiena Deep gold system and define its internal geometry as quickly and efficiently as possible. Confidence in internal grade and continuity will de-risk a decision to initiate ramp development to provide definition drilling and access to Kiena Deep as soon as possible. The Company intends to continue the drilling campaign with four underground drills. Ongoing evaluation for the requirement of enhanced drill platforms will determine the timing of underground ramp development, as the location of this infrastructure is dependent upon drilling results currently being generated. The Company is very encouraged by the continued exploration results at Kiena and the potential to re-establish production at this fully permitted facility. As a result, we are pleased to announce the appointment of Marc-Andre Pelletier as Wesdome's Vice-President of Operations for Quebec in charge of the Kiena Mine Advanced Exploration Program. Marc-Andre is an experienced professional mining engineer who was most recently Vice-President of Operations at St Andrew Goldfields Ltd. Prior to Marc-Andre's tenure at St Andrew's he was employed by Barrick Gold Corporation from 2001-2009 elevating to the position of Mine Superintendent at Barrick's Williams Mine. Prior to his Barrick experience Marc-Andre worked extensively in Quebec in progressive technical roles. Throughout his career Marc-Andre has dedicated himself to achieving safety, production, and costs targets. He is a graduate of Laval University in mining engineering and is a resident of Rouyn-Noranda, Quebec.